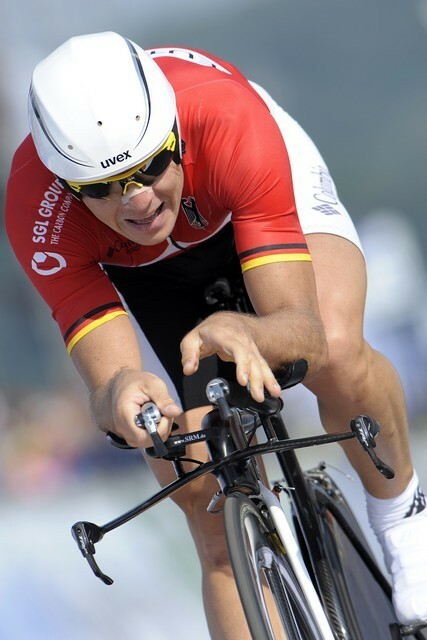 Germany’s Bert Grabsch secured a surprise but well deserved world time trial championship title in Varese on Thursday, beating another surprise package, Svein Tuft of Canada and Dave Zabriskie of the USA. Grabsch set a time of 52-01 for the 43.7km course, blasting around Lake Varese at over 50km/h. Tuft was 42 seconds slower, with Zabriskie at 52 seconds. Britain’s David Millar was ninth and Steve Cummings was 25th. With double world champion and Olympic champion Fabian Cancellara of Switzerland opting to miss this year?s worlds, the time trial was wide open and up for grabs for whoever could pull off a good ride on the technical descent and climb to and from Varese and then put down the power and speed around the lake. Grabsch got it perfectly right, while others were well off the pace. Levi Leipheimer, the man who flew to both time trial victories in the Vuelta a Espana, had clearly tailed off rapidly and could only manage a tired fourth. Olympic silver medallist Gustav Larsson of Sweden was fifth at 1-05. Britain’s David Millar was ninth and Steve Cummings was 25th, while local resident Michael Rogers of Australia was only 12th at 1-27. Grabsch broke Svein Tuft’s best time at a point in the race when first Tony Martin, then Tuft and then Grabsch lowered the previous best time of Janez Brajkovic. From then Grabsch had a nerve-wracking half-hour wait in the hot seat to see if his time would stand. It did, and it meant gold for the Team Columbia rider. Tuft’s time could have been even better had he not had a front wheel puncture during the final kilometres of the course. He changed bikes, finishing on his road bike but hung onto an impressive second. Though not perhaps household names with super-star profiles, the time trial podium was a good result for clean cycling. Grabsch was fourth last year and has had a good year with Team Columbia, Svein Tuft was seventh in the Olympics and rides for the small Symmetrics team, which has a strong anti-doping ethos, and David Zabriskie rides for Garmin-Chipotle, with its independent testing system. Grabsch admitted he was surprised to pull on the rainbow jersey but pointed out that he deserved it considering his time trialing pedigree and results in recent years. ?It?s a big but very nice surprise to be world champion. It was a perfect day for me. The course was perfect and the weather was perfect. What else can I say when you become world champion. I?m totally happy,? he said. ?The course was fast and I did an average of over 50km/h. I?ve won other races before at this speed. This course was very different to the course in Beijing, the long climb was decisive in the Olympics but this course was perfect for me, it was fast and I like it when it?s a fast and not with a lot of climbing.? ?Last year I was good in every time trial I rode. I was fifth and fourth in the Vuelta time trials. I was fourth in last year?s world championships and I won the Germany time trial championships last year and this year. I beat Stefan Schumacher to win this year and then he went on to win the time trial in the Tour de France, so I know I?m strong in time trials.? Scroll down and read upwards to see how the race unfolded. 14.50pm HOW DID CW DO? Before the race CW predicted the top ten of the men’s elite time trial. How did our men do? So, apart from Clement, who had a shocker, all our men were in the top 13. In fact, we tipped seven of the top 10, so that’s not too bad. We under-estimated Tuft, Devolder and Brajkovic. Leipheimer has had a bit of a stinker ? certainly compared to his strong rides in Spain at the recent Vuelta. And he’s going to miss the medals completely. Olympic silver medallist Gustav Erik Larsson is outside the medals, with just Levi Leipheimer to finish now. Only 10th place at the moment for Rogers. That guarantees Grabsch a medal but will it be gold, silver or bronze. Larsson and Levi will decide that. Three riders to finish now. Rogers, Larsson and Leipheimer. Rogers won’t win a medal today either. He’s already outside the top three with a few hundred metres to go. Britain’s David Millar is likely going to be in the top ten but he won’t be ecstatic with his time, which is only seventh best at the finish so far. Michael Rogers isn’t going to win today. He’s a minute down at the third checkpoint. It’s looking good for Grabsch at the moment. It’s descending into farce in the Eurosport commentary box, with David Harmon stating he is 6ft 2in and Sean Kelly and Emma Davies disputing it. David Zabriskie is not going to win today. He is probably not going to get a medal either. Third fastest right now in 52-53. Leipheimer is in fifth at the third checkpoint, so he’s struggling too. Certainly hasn’t got his Spanish form with him today. Sylvain Chavanel finishes. Top six so far. Top 10 may look a bit ambitious now. Marco Pinotti wins the battle of the Italians by three seconds. Good enough for seventh fastest so far. Just nine riders to finish now. Millar is not doing a great time and is reaching the checkpoints in the bottom half of the top ten. The man with no team, after being sacked by Astana, Vladimir Gusev, is sixth fastest at the finish right now. Outside chance of the top 10. Grabsch is the quickest and could be in line for a medal. Meanwhile, Tuft apparently had a mechanical problem and had to swap bikes between the third checkpoint and the finish. How much has that cost him? It could be the difference between winning a medal and not. It’s like a game of dominos here and it’s testing your correspondent’s typing skills to the full. First Devolder sets a new best time, then Tuft breaks it. Now Germany’s Bert Grabsch ? the next rider to finish after Tuft ? has broken the time. Grabsch is the first to average more than 50kph too. That’s the ride of the day so far by Canada’s Svein Tuft, who has wiped the floor with Devolder’s time to top the leaderboard. 52-44, first man under 53 minutes. Next up is Bert Grabsch who has been very quick too. Belgium’s Tour of Flanders winner, Stijn Devolder has done a super ride and is going to push Martin’s time all the way. He does it by 0.85sec. Martin is knocked off the top. Former silver medal winner Jose Ivan Gutierrez may struggle to make the top ten this time. His time of 53-56 puts him fifth at the moment with 17 riders still to finish. Steve Cummings finishes his ride and won’t be too happy with his time. He is currently in 10th place so could be looking at the top 20. He shakes his head as he crosses the line. Cummings has been in great form, with second place in the Tour of Britain last week. The young German Tony Martin has broken Brajkovic’s time. CW tipped Martin for the top five today and on that form he could very well do it. Svein Tuft of Canada is flying. At the third check he is 41 seconds quicker than Brajkovic at the third check point. According to his Symmetrics team website, one of his hobbies is freestyle wrestling. (We’re not making this up). The first of the Italian riders, Manuel Quinziato has done well and is second fastest so far. CW can reveal that in April, Quinziato was spotted with his Liquigas team-mates enjoying a pizza in an Italian restaurant in Kortrijk the night after Ghent-Wevelgem. And he asked for a bottle of Heinz tomato ketchup. Meanwhile, Levi Leipheimer has either started very conservatively or has had a problem. At the first check the last man on the road is only 16th fastest. Millar certainly looks good on the bike, but at the moment the times out on the course are being done by Tony Martin, Jose Ivan Gutierrez and Svein Tuft. Cummings is 11th fastest at the third checkpoint. David Millar is just seventh fastest at the first check point, but that’s the hilly section so he’s probably measuring his effort. But Tony Martin ? one of CW’s tips for the top five ? is going extremely well. He could well break Brajkovic’s time at the finish. Leipheimer sets off. The last to start. Fresh from second place in the Vuelta, where he also won both time trial stages. He’s the big favourite in the absence of Cancellara. 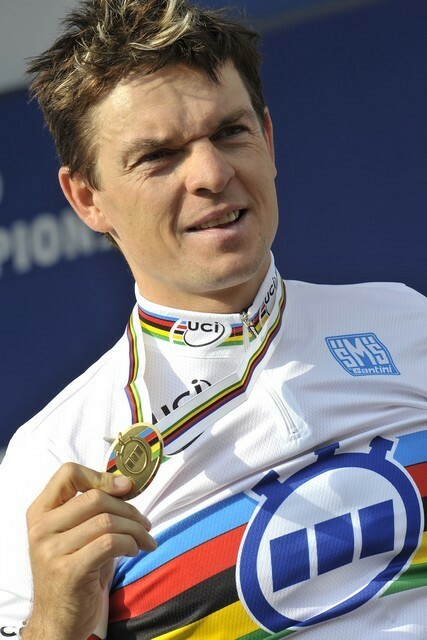 Can he convert that into a gold medal and a rainbow jersey? Michael Rogers, the three-time winner, recovered from Epstein Barr virus, has just started, meaning just Gustav Erik Larsson and Levi Leipheimer to go. Here comes Janez Brajkovic, with the new best time. He has really stepped up in the second half of the race and has timed his effort well. Canada’s Svein Tuft, the revelation of the Olympic Games time trial, where he was seventh, is going well, with the best time at the first check point at the moment. Belgium’s Stijn Devolder is also going well, beating Tony Martin’s time at the second check. Millar has just rolled down the start ramp. This is the big goal of his season and a chance to win a world time trial title clean. “I’ve been getting ready for this since the Tour de France. It’s a beautiful time trial. It’s got a little bit of everything. It’s not too technical, there’s a bit of climbing,” he told Eurosport. Sweden’s Frederic Ericsson has done a great ride and slots into the top of the order in third place. Looking at the riders who did well in grand tour time trials this year, it’s easy to spot that double Tour de France stage winner Stefan Schumacher is not here. Nor is Christian Vande Velde, or the likes of Denis Menchov and Cadel Evans ? all of whom were top ten in Tour time trials. Kim Kirchen decided not to ride as well. Likewise, there’s no Marzio Bruseghin (Giro time trial winner), or Alberto Contador. But Tony Martin (who won the other Giro TT) and Levi (won both Vuelta TTs are here). It’s a funny old race the World Time Trial Championships. Often the focus is on who’s absent, rather than who’s in the race. The winner for the past two years, Fabian Cancellara has cried off, like a great big tired wimp (not that I’d say that to his face). While that makes it a more open and interesting race today, there is a nagging suspicion that the title should be temporarily known as ‘the best time triallist in the world apart from Fabian Cancellara’. Sylvain Chavanel of France has set off, There are just eight riders to go after him. 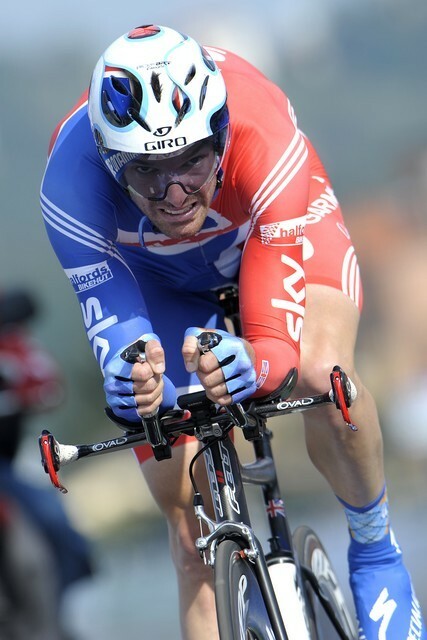 Next is David Zabriskie, then at 1.46pm, it will be the turn of David Millar. Gonchar sets the new best time at the finish 53-39. Now riding in relative obscurity following his sacking by T-Mobile in 2007, Gonchar has won medals at the Worlds before. In 2006 he won both time trials in the Tour de France. Looks like Sergei Gonchar is going to do a decent time, but back down the course the German Tony Martin and Jose Ivan Gutierrez of Spain have both started extremely well. CW tipped Martin to finish in the top five today ? but perhaps unwisely left Gutierrez out. Matej Jurco of Slovakia has beaten Kunitski’s time, with a very impressive 53-59. The French rider Jerome Coppel, who has twice won medals in World Championship under-23 time trials, broke his handlebars before he’d even got down the start ramp. He had to stop and swap bikes. Steve Cummings of Great Britain has just started his ride. 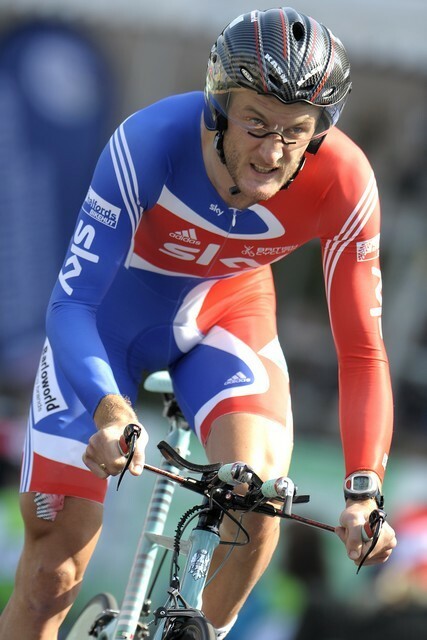 He would have been inside the top five in the time trial in Beijing had his chain not fallen off on the climb. Following Cummings is former silver medallist Jose Ivan Gutierrez. Back down the course Janez Brajkovic is breaking the marks set by Serguei Gonchar, who was sacked by T-Mobile in 2007 after registering some unusual blood test results. He now rides for a tiny Luxembourg-based team. Slight turn-up for the books there as the rider from Belarus, Andrei Kunitski beats Plaza’s time. Kunitski covered the 43.7km course in 55min 10sec. Plaza isn’t as good as he used to be. Remember at the end of the 2005 Vuelta a Espana he won the final time trial at an average speed that was quicker than any ever recorded by the great Miguel Indurain. Plaza’s speed that day was 56.22kph. He beat Roberto Heras – that noted TT expert – by just a fraction of a second. Heras was later stripped of that 2005 Vuelta win because he tested positive for EPO. Ruben Plaza of Spain has the best time at the finish. 55 min 31 sec. Frantisek Rabon is the first of seven Team Columbia riders in today’s field. He’s one to watch from the early starters and has the fastest time at the first checkpoint. The other Columbia riders are Adam Hansen (Australia), Tony Martin and Bert Grabsch (Germany), Marco Pinotti (Italy), Edvald Boasson Hagen (Norway) and Michael Rogers (Australia). Welcome! Perhaps you are at work, unable to watch the pictures on telly but able to discreetly follow a text update. It’s lunch time. What’s everyone having? Tomato, mozzarella and basil ciabatta here, just to help get into the Italian spirit. The coffee is on too. The race has been underway for half an hour and about 15 riders are on the road in the 43.7km race around the lake.